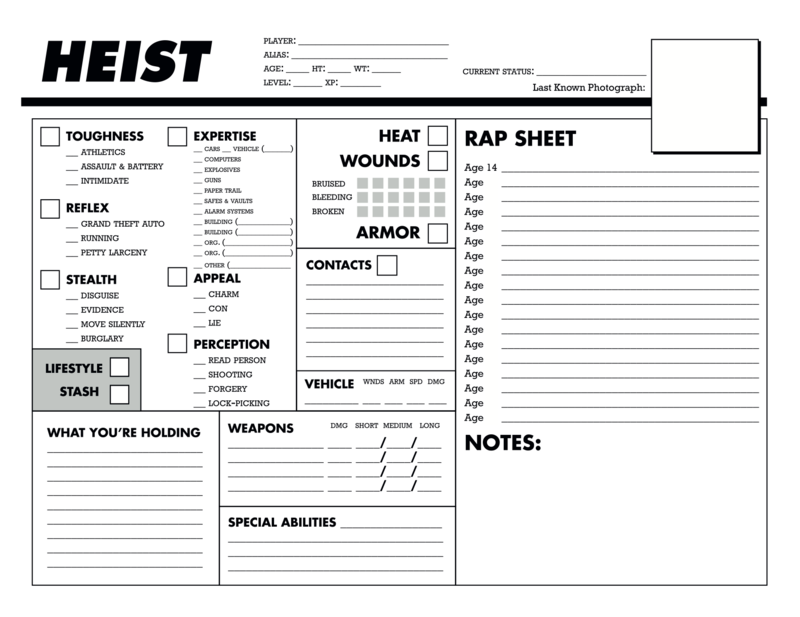 I’ve been working on this Rap Sheet System for Heist for a little bit, and one of the big pieces of feedback I’ve gotten is that it requires too much flipping, both in printed form and on the website. The system isn’t quick, which is fine because it’s a lifepath style generator, but what’s annoying is that all that time should be spent rolling, not flipping around a rulebook. Finally, I got it down to two pages. Please feel free to download them. The first page is where the action’s at. This is everything you need to roll on in rough order, labelled clearly. You don’t have to flip or scroll around. 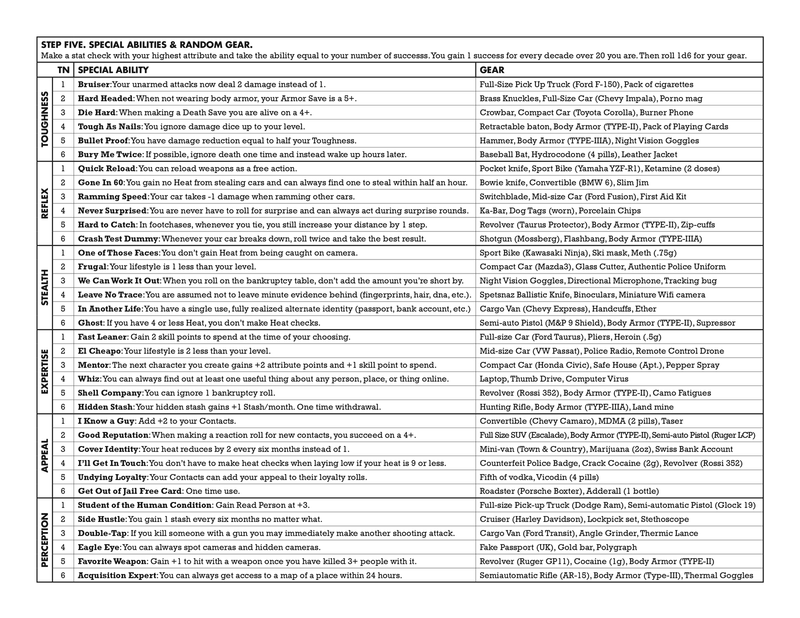 You can just print this out (please do) pass it our to your players, and get moving. The second page you only need one copy of, as you only roll on it when you’ve completed character creation. Once to see what your special ability is and once to see what random gear you get. If Mothership hadn’t already made it abundantly clear, it’s really important to me that character creation is fast and requires very little access to a book. Even in Heist where the character creation takes longer (than say Mothership) it should still be as fast as it can be. Or a better way to put it is that it should be as not annoying as possible. Character creation in 5e can be annoying. You have to flip around a decent amount and look stuff up. But most people probably do it at home on their down time. It’s also good salesmanship, because if you want to make character creation go faster, the easy thing to do is just buy more copies of the Player’s Handbook. This, to me, is always where the bottle neck in chargen in. People passing books around. Get players back in the action as soon as possible. For that, they can do the fast character creation system and then plop them in the middle of the action. Let the player stay dead or imprisoned or whatever, and have them roll up a character the long way. Either way the player needs to be engaged and having a good time. Rolling up a new character is fun, listening to your friends split up your loot when you’re dead is fun (to me), and it’s important to me that we handle both scenarios (get them back in the game ASAP and let them take their time) well. 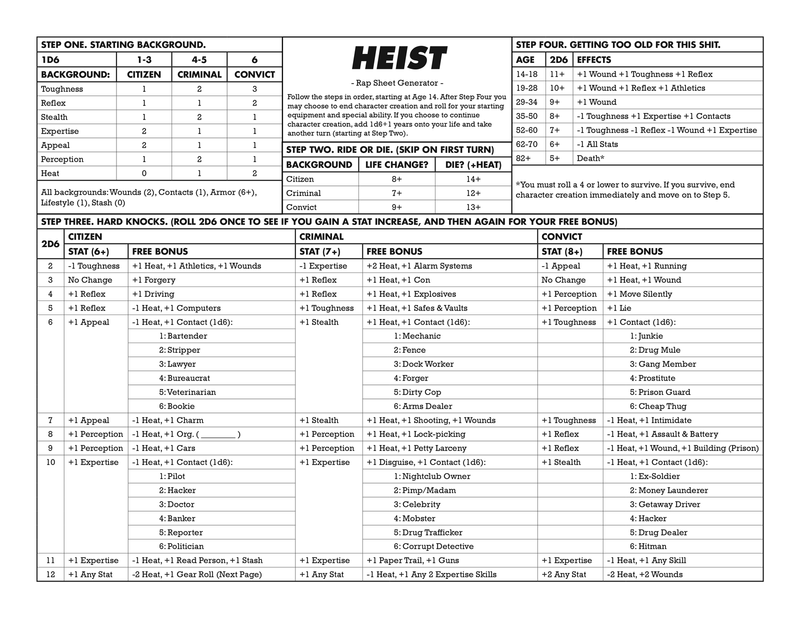 All of Heist’s rules are free online and if you’re interested, I’d suggest you check it out. I’ve been working on it a lot recently, and if you’re interested in doing some playtesting, get at me and I’ll send you some materials to use.